In 1664, the English wrested control of the colony from the Dutch, and renamed it New York. Newtown, along with Flushing, and Jamaica, became part of newly established Queens County. Although the inhabitants supported the Loyalist cause during the Revolutionary War (1776-1783), Newtowners easily adjusted to the new American leadership when the war ended. In the post-war period, the farms in Newtown supplied New York’s growing urban population with food for both consumption and export. Some wealthy New Yorkers built elaborate estates in the bucolic surroundings, but it was Newtown’s waterfront that attracted the interest of oil industrialists. As new oil deposits were discovered in Pennsylvania, refineries sprang up throughout the Northeast, and Newtown Creek became one of the targeted sites. By the late 1880’s, the area was becoming increasingly industrialized and the combination of the oil refineries, toxic waste, and garbage dumping was eradicating Newtown’s rural charm. In 1893 Cord Meyer, a Brooklyn attorney, purchased the property belonging to Samuel Lord, the founder of the Lord and Taylor Department Store, and the largest landowner in Newtown. Meyer and his brothers transformed Newtown from a declining agricultural region into a middle class residential area. They laid down streets, constructed a sewer system, brought in gas and electricity, built a bank, and set up a system of trolley cars. To reflect the change in Newtown’s fortunes, and to disassociate it from the foul-smelling Newtown Creek, Newtown was renamed Elmhurst for the groves of elm trees in the neighborhood (although Newtown High School is a reminder of its colonial past). Elmhurst continued to develop through the 20th century, and begins the 21st as one of the most diverse communities in the United States, home to immigrants from Asia, South America, Europe, and Africa. 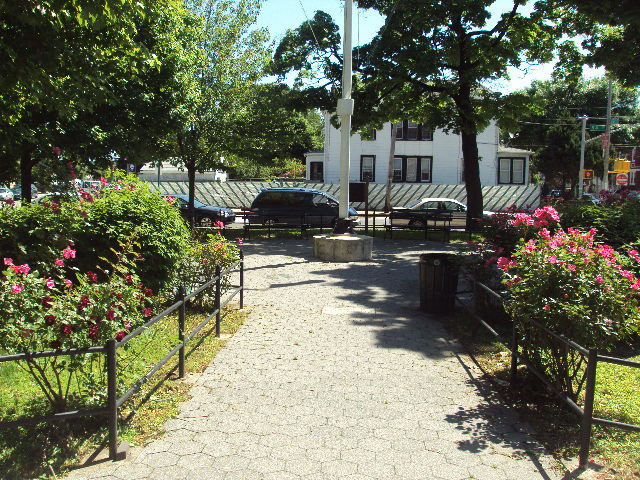 Veterans Plaza, in the northeast section of Elmhurst, is bounded by 32nd Avenue, 94th Street, and Jackson Mill Road. Parks acquired this property in portions between 1928 and 1932. In 1935, a resolution by the Board of Aldermen (predecessor to the City Council) named the property Veterans Memorial Park of Elmhurst Manor in honor of the soldiers who gave their lives in World War I (1914-1918). In 1997, Parks Commissioner Henry Stern renamed the park Veterans Plaza. Renovations were completed in 1997, thanks to a $213,000 contribution by Councilwoman Helen M. Marshall. The landscaping includes several species of shrubs, flowering bushes, and trees, including the Norway maple (Acer platanoides) and the red mulberry tree (Morus rubra). There is a central flagpole with yardarm, a compass set into the ground stone, and small cast-iron sculptures of rabbits scattered among the shrubs.